One way to get some feel for the scale of this spike is to compare it to bank reserves --- the fraction of holdings (10% or so, with some exceptions) which banks are required to keep in cash. 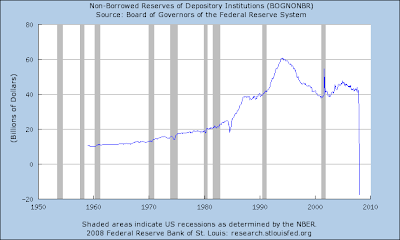 Which is, effectively, what you get by looking at this graph of "non-borrowed reserves" (that is, actual reserves, less what the banks have borrowed from the Fed): If you read the graph carefully, you'll notice that the most recent figures are negative, at $17.6 billion below zero as of Feb. 1st (the most current figure available, as I write). There's still money in the banks, but it's borrowed. And yet, this is not the apocalypse! Well, at least not by itself. To understand why, let's first remember why banks are required to hold cash reserves at all. They'd prefer to hold something else: titles to loans, bonds, other debt instruments, or (increasingly) messy derivative concoctions which represent baskets of these, or options to buy or sell them at some future time, or option contracts on baskets, or ... well, never mind. It gets weird. But the basic point is that all of these things generate income for the banks. Cash --- green paper, with picutres of dead presidents on it --- generates no income when it's sitting in a vault. Banks, being profit-making institutions (or, at the very least, hoping to be) prefer income when they can get it. But their depositors have this awkward habit of asking for green paper on a fairly regular basis, and sometimes in bunches. So, the Fed requires the banks, as a condition of doing business with consumers, to have a stash of it on hand to meet the demand as it may arise. But while holding cash doesn't make the banks any money, borrowing actually costs them --- they have to pay interest on the loans from the Fed. Why would a bank ever do this? Well, that's a question which may be best answered by example. Cast your mind back to the hoary days just after September 11th, 2001, when the stock market briefly went into free-fall. Traders the world over had convinced themselves (or acted as if they had --- which is all that matters here) that because two buildings had fallen down in New York, the American economy was going to implode, and that stock in companies located all over the country was suddenly worth a fraction of what it had been worth a few days before. This was totally unreasonable --- but reason wasn't part of the process. It was just a blind panic, which was over a few weeks later. But people who, for whatever reason, had to sell a lot of stock in the interim got a lot less than what it was actually worth. Now, imagine that you were running a bank that was holding equities. (Slightly fanciful, since banks tend not to be too deep into equities, but conceivable --- and a lot of the stuff that they do commonly hold also tanked). And let's say that you had some stuff that you were planning to sell, but because of the panic, you couldn't get fair price. Well, it might make sense then to use the stuff instead (or some other stuff that you had on hand) as collateral for a loan from the Fed; that would cost you something, but not nearly as much as selling into the panic. This way you get to actually sell and repay the loan after the panic is over and prices have recovered; the loan cost you something, but not nearly as much as the loss on a panic sale. Well, the panic right now isn't in stocks. It's in mortgage-backed securities (in effect, claims on shares of thousands of individual home mortgage payments), which no one wants to buy right now. So, rather than try to sell them, the banks are instead raising cash at the Fed borrowing window. (Or, actually, a couple of new windows; in addition to the traditional discount window, the Fed is now operating a new one called the TAF, for depository institutions, and has announced another, called the TSLF, for investment banks, which it doesn't ordinarily deal directly with at all --- with some technical safeguards.) And when the panic is over, the stuff can get sold, the loans can get paid, and we can all pretend this awkward moment just never happened. So long as the panic ends. The problem, here, is that unlike post-9/11 stocks, a lot of the mortgage-backed securities genuinely are unsound. They represent mortgages given to people on the expectation that the price of their houses could only go up. Prices have, instead, been dropping, and 10% of American homeowners are now "underwater" --- they owe more on their house than it is actually worth. If they wanted to sell it in the ordinary way, they'd have to bring their own check to the closing to give the lender everything they owe, so the lender would drop their lien and allow the sale. And the fraction only goes up as the prices drop. But in most states, the worst the lender could do if the homeowner instead just stops paying is to seize the house --- in which case, the homeowner writes no check and, instead, the bank takes the loss. Under the circumstances, it's pretty clear which choice makes the most sense for the home-debtor --- and if it isn't clear to them already, companies like this one are more and more eager to tell them. So, what if the panic is justified? What might we do? Well, one option would be to try to forgive portions of the loans to people who could pay the rest, as suggested by Barney Frank. This wouldn't restore the value of the securities backed by their mortgage payments to par, and it wouldn't continue to rake in payments from speculators who bought houses just to resell them for more, and have no reason to hang on anyway; trying to rescue those mortgages would just be throwing good money after bad. (Which is why Frank's plan has qualifications set up to try to exclude these guys). There are other plans as well, which would, for instance, allow bankruptcy judges to reduce the total amount of a mortgage. Which actually sounds like a good deal for the lender, compared to the alternative: they get only some of what they're owed, but that's better than nothing. But Dubya has already more or less announced his opposition to some of these interventions, either because it's too drastic for him, or because it helps too many poor people. If his family hedge fund is getting wiped out, why save any of the poor? Priorities! Which brings us to the alternative: large financial institutions going belly-up. As I write, the venerable Wall Street investment bank Bear Stearns is in deep trouble, and has already been given a temporary bailout by the Fed (a large loan, with J.P. Morgan/Chase acting as middleman because the TSLF isn't running yet). And yet, even if we accept that some institutions have to be treated by the government as "too big to fail", Bear, at least at first glance, just doesn't look that big. If you're not impressed by an occasionally clueless New York Times columnist with deep qualms about the deal, I'll raise you Willem Buiter, a professor at the LSE with a blog hosted by the Financial Times. By the time you read this, it may have already been sold. So, why not just let it go broke? And so, the solons of Washington declare that bailing out Bear was "the right decision", while Dubya himself declares that bailing out poor homeowners may be too risky to contemplate. And at this point, let's consider: these guys on Wall Street who are now going broke are the same ones who have, for the past few years, been defending their own huge and growing salaries by saying they were helping to produce a smoother, more efficient economy that would function better for everybody. Instead, their companies are going broke, and threatening to take the rest of us with them. There may be a moral case for keeping the operations of Bear, Stearns going, if the alternative is that the whole tower of financial Jenga that is modern Wall Street comes crashing down. But there is no moral case for letting the people responsible escape on golden parachutes, or even letting shareholders who put equity in their operations keep much of it. If anyone deserves a bailout, it's the small homeowners who heard financial authority figures telling them for years that buying a house was a wise decision on any terms (remember Alan Greenspan personally touting risky adjustable-rate mortgage deals to prospective buyers?) only to be faced with unsustainable payments and huge financial losses (at least on the scale of an ordinary household). And, as we've already seen, helping the homeowners would indirectly help the Wall Street institutions as well, a very great deal. Perhaps critical help, because even the Fed's current desperate measures have their limits. For obvious reasons, they're not just printing all those dollars that they're loaning to the banks, though they could; instead, they're funding those loans by selling from their stash of absolutely secure government bonds. But that hoard, while huge in ordinary terms (hundreds of billions of dollars' worth), is finite --- past a certain point, they'll have to start doing something else, perhaps something even riskier than helping the afflicted. Do you think that if a Washingtonian council of elders came along to humbly explain to Dubya exactly why helping the poor might be necessary, if only to indirectly bail out the rich, he might listen? Yep. Just like the Baker commission convinced him that it was time to start reducing troop levels in Iraq. Lots of luck. To all of us. Update: Well, what do you know? 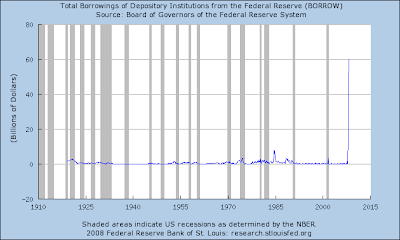 I, and Buiter, gave the Fed too litle credit. Bear Stearns sold to J.P. Morgan/Chase for $2.00 a share, down from about $70.00 at the beginning of the week (and over $100 last summer). Close enough to zero. Also of note: employees owned one third of the shares. That has to include a lot of small fry who didn't have much to do with the fatal mistakes. You've got to hope it wasn't them that took the brunt of it... and that the real damage was concentrated on the people that deserved it.